On Feb. 12, Iraq became the latest country to join the Chemical Weapons Convention. 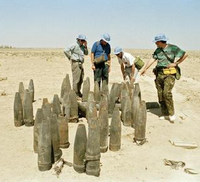 The country's entry was especially important in light of the widespread use of chemical weapons by former Iraqi dictator Saddam Hussein against his foreign and domestic enemies. Under Hussein, Iraq developed a major chemical weapons industry. During the 1980s, the regime killed thousands of people by repeatedly employing chemical weapons against both Iranian troops during the 1980-88 Iraq-Iran War and its domestic opponents, most infamously in the March 1988 mustard gas attacks on the Kurdish village of Halabja.